BCS Communications, a division of Boehringer Ingelheim, had a great time and made a significant contribution when they got together in San Antonio, Texas, for a wonderful Build-A-Bike Team Building Event. 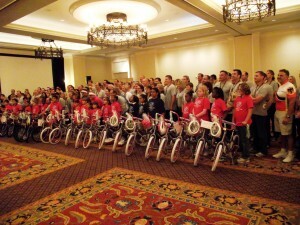 About 180 reps from across the country got together to enhance their team building and leadership skills, while at the same time having a lot of fun and laughter and making a contribution of 28 bikes to the Boys and Girls Clubs of San Antonio. There were several activities including a flag and cheer competition, as well as the bike building. All the activities are designed to be fun, but also provide for the opportunity to put into practice leadership and team building skills. The highlight of the event is at the close when the grade school age boys and girls are introduced to receive the bikes. It is a great moment and makes the activities of the day all worthwhile.